Spectra Rookie Jersey Autographs are returning for 2018. Find on-card autographs of players like Shohei Ohtani, Miguel Andujar, Rafael Devers, Rhys Hoskins, Amed Rosario and many more! Prizm Signatures are making a return to baseball. Look for the rare Gold and Gold Vinyl parallels! NEW: Rookie Cornerstones features 4 corner swatches and an on-card autograph. This unique design has 4 parallels #’d/49 or less! NEW: One of the most popular Panini brands, Select makes its return to baseball in 2018 Chronicles! Also look for a Select base set that feature 9 parallels! NEW: Phoenix is making it’s baseball debut! 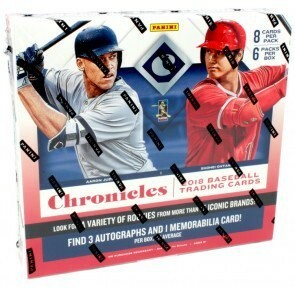 Look for a mix of veteran and rookies with 9 parallels! Contenders Cracked Ice is one of the most recognizable autographs on the market. Find top rookies and parallels like Playoff, Championship and Printing Plate Tickets! Look for a larger variety of rookie cards in 2018 Chronicles, including an all new base design!